The World Jewish Congress urged Europe's governments to consider a ban on far-right parties, at the end of a conference in Budapest. The World Jewish Congress (WJC) urged Europe's governments on Tuesday to consider a ban on far-right parties, at the end of a three-day conference held in Budapest. The WJC, which represents Jewish communities outside Israel, adopted a resolution calling on governments in Europe to "consider banning neo-Nazi parties or organizations whose aim is to overthrow the democratic order, or which pose a threat to the safety and well-being of ethnic, religious or other minorities," according to AFP. The resolution also urged parliaments to "enact and enforce legislation, against threats of violence, racist hate and insults and the denial of the Holocaust". The WJC decided to meet in Hungary this year in solidarity with the EU member's Jewish community which it says has suffered increasing anti-Semitism in recent years. The three-day plenary assembly, which was attended by more than 500 delegates representing over 70 Jewish communities around the world, was also addressed by Hungarian Prime Minister Viktor Orban who told the gathering that anti-Semitism was "unacceptable and intolerable". Afterwards, the WJC expressed "regret" that Orban did not address recent anti-Semitic incidents or provide sufficient reassurance that a clear line has been drawn between the government and the far-right Jobbik party. Recent anti-Semitic incidents include Hungary's chief rabbi being verbally abused on a Budapest street, anti-Semitic chants at a football match against Israel and pig's trotters being placed on a statue of Raoul Wallenberg, the Swedish diplomat who saved thousands of Budapest Jews in World War II. In late November, a far-right deputy from Jobbik called publicly for the resignation of a fellow MP who claimed to have Israeli citizenship. The comments came after another Jobbik parliamentarian released a statement saying that a list should be compiled of all of the Jewish members of government. In a speech to close the conference Tuesday, however, the WJC's president, Ronald Lauder -- who was re-elected unopposed Monday for a further four-year term -- said that Orban had spoken out clearly against Jobbik in a recent interview in an Israeli newspaper. 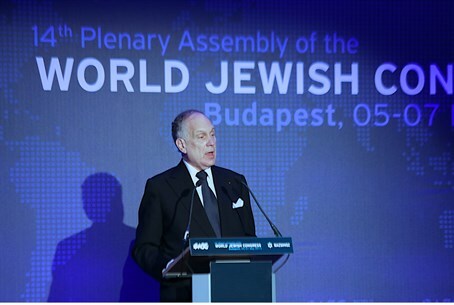 Lauder warned in a speech at the conference on Sunday that continued anti-Semitism is causing Hungarian Jews to consider leaving the country.